With the backcountry shelter atop Muir Pass in the background, strings of Mt. Whitney Pack Trains' mules make their descent from Muir Pass southward towards Helen Lake and into Le Conte Canyon and the Middle Fork of the Kings River. This was not so much an uncommon sight, mules traversing snow; what was unusual about this passage is that the snow was so expansive and so deep that it required a rare early morning traverse. Shoveling out the snow, a packer's second occupation on some summers, was out of the question. An earlier air survey of the area by Bob White's flying service out of Lone Pine confirmed the extraordinary amount of snow still on the pass. The packers began packing up their strings of mules in the early hours of the morning by the light of the moon. 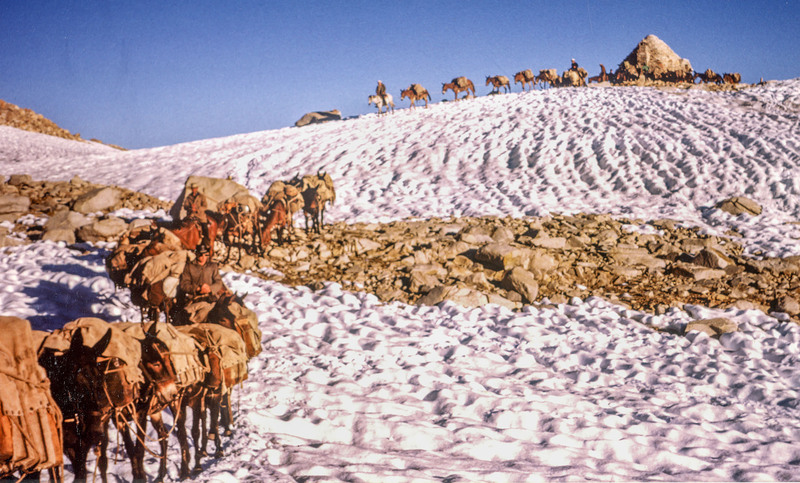 By the time they reached the summit of Muir Pass, the sun was just beginning to come up and the snow was still frozen solid enough to support the weight of the fully packed mules. L/R: Jim Gordon, Loren Joseph, Ken Hess, ? Photo courtesy of Ed Turner With Consultation Lake below as a backdrop, Mt. Whitney Pack Trains' packers loose herd their mules from Trail Camp westward up and over Trail Crest Pass at 13,777' on their way to Guitar Lake and Crabtree Meadows. 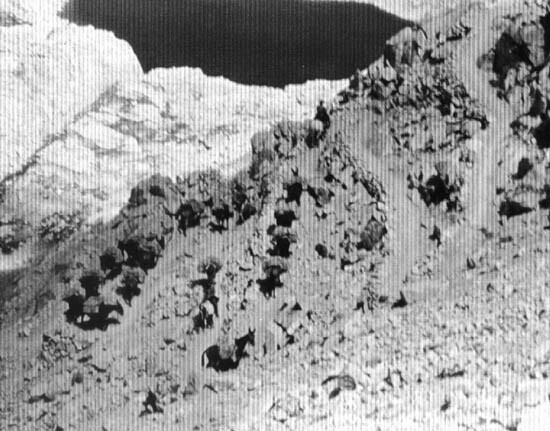 These are the infamous switchbacks which nearly every packer spent time shoveling out at one time during his packing career. Believe me when I say that there is nothing more grueling than shoveling snow, sometimes seven feet deep, at 13,000'. Even being acclimatized doesn't seem to help out a great deal. up and rode to Trail Camp at 12,000' where we left our horses and proceeded to hike up to the snow with shovels and pickaxes in hand. This job, being a packer, would either make you or break you! I'm convinced this aspect of the packer's job is what broke my brother; for, he never returned to work for the outfit after this summer. I'm sorry he never returned, we could have had a great time packing for the outfit together. I went on to shovel out this pass for several more years in my packing career. In addition Trail Crest there was also Muir Pass, Bishop Pass, Chicken Springs Pass, Army Pass and Cottonwood Pass, to name but a few, which saw my shovel and the shovels of many other packers over the years. John Maddux of San Luis Obispo, CA writes. Great sight! 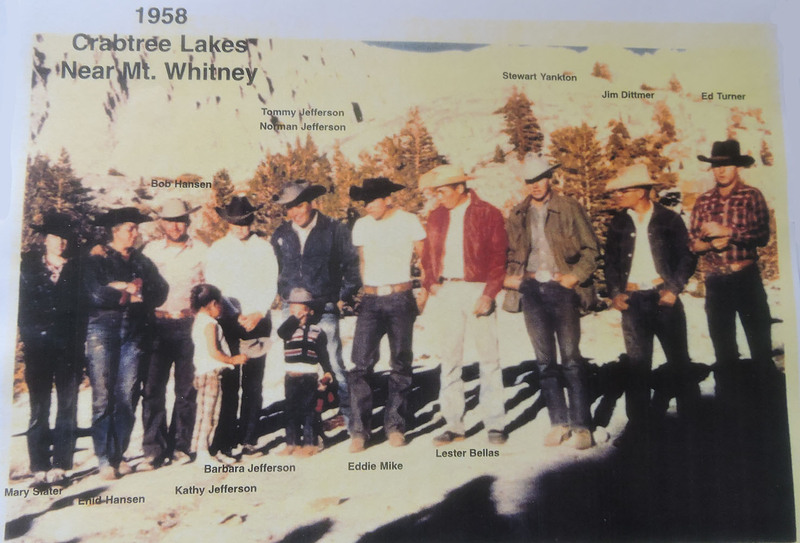 Worked for Cottonwood Pack Station in the early 60's just a kid but enjoyed it so much use to supply the Golden Trout Camp and take supplies into Tunnel Air Camp things Mr. White did not fly-in. I remember running into some of your packers when we took trips north. You had some good looking stock. I have been working for Caltrans for 32 years get to the mountains every so often, but I do miss the time in the back country. Thanks for brining back some very good memories! From the 1955 Sierra Club "Bulletin"
Thanks for your note. I was a barn boy - helping people get out of Carroll Creek, "training" burros for the Sierra Club, breaking colts - in 1956. 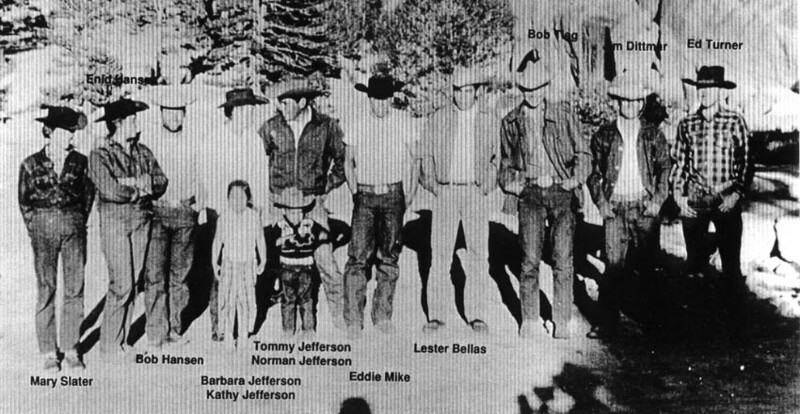 Then I packed legitimately in 1957 and in 1958, working in Jackson Hole in 1959 and in 1960, and returning to pack for Mt. Whitney Pack Trains in 1961 and 1962. I remember being intimated by Tommy for at least two summers. He was one of the best tough bosses I ever had. I'm grateful for that experience, and that he taught me how to shoe. Best wishes to all the crew. Strange to think back to those days from the perspective of being retired from a long intervening career. We had some good times. What I learned from Bruce, Charles, and Tommy matches what I learned in gathering a bachelor's degree and two masters degrees. As a principal of a local high school, I told my students that I learned how to work with kids by working with mules (and I told the kids I loved my mules). Because I'm tall I packed grain and other heavy loads on Roberta, Nina, Joe, Coso, and Maria; and was honored to take over Shorty, June, Susie, and oh the memory fails, when Tommy got distracted. An impending divorce caused me to cancel out on the reunion and I've always regretted the missed opportunity. It's great to see the pictures of so many folks I worked with. Thanks.